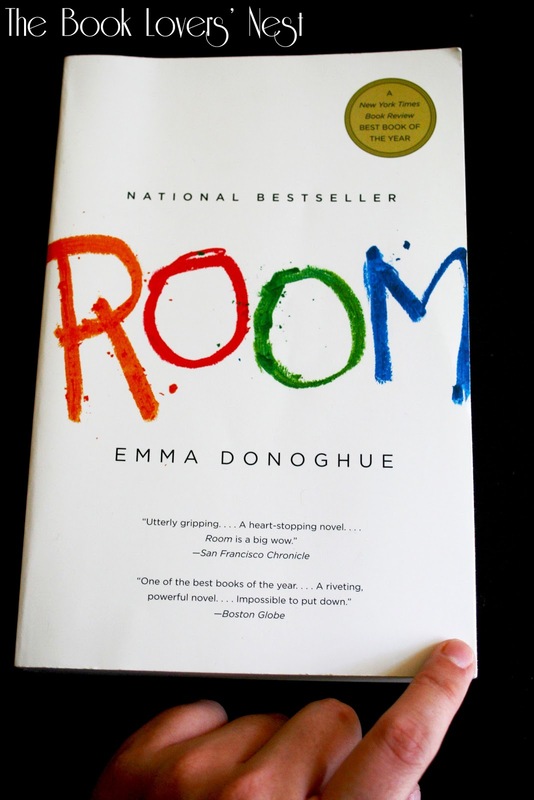 About a million years ago, I posted about reading Room by Emma Donoghue. Long story short, life got in the way, and I never finished the book. So I quietly put it back on my shelf, marked it as to-read on Goodreads, and just this week picked it back up. I finished it in about a day (thereby adequately shaming my past self) and was completely captivated. It's a beautiful and heartbreaking story, focusing on one of the most horrific tragedies (kidnapping, captivity, and sexual abuse) that can happen to a person while illuminating the power of the human spirit and the depth of love and courage that people can still have in impossible situations. I walk to Bed Wall and touch it with one finger, the cork doesn't feel like anything. "Is it good night in the day?" "Can we say good night when it's not night?" "I think it would be good-bye." "Good-bye, Wall." Then I say it to the three other walls, then "Good-bye, Floor." I pat Bed, "Good-bye, Bed." I put my head down in Under Bed to say, "Good-bye, Eggsnake." In Wardrobe I whisper, "Good-bye, Wardrobe." In the dark there's the picture of me Ma did for my birthday, I look very small. I wave her over and point to it. I kiss her face where the tears are, that's how the sea tastes. I put the me picture down and zip it into my jacket. Ma's nearly at Door, I go over. "Lift me up?" Ma sits me up on her hip, I reach up. She holds me by my ribs and lifts me up up up, I touch the start of Roof. I say, "Good-bye, Roof." Ma puts me down thump. "Good-bye, Room." I wave up at Skylight. "Say good-bye," I tell Ma. "Good-bye, Room." Ma says it but on mute. I look back one more time. It's like a crater, a hole where something happened. Then we go out the door. To me, this passage underscores how people who suffer traumas and acts of atrocity often carry these tragedies with them. They do not have to define them or limit them, but they are a part of who these people are. It doesn't help to hide these traumas away, to act like they didn't happen. As Jack says, they leave a hole where something happened, a hole that needs to be recognized, addressed, dealt with out in the open. Room is a physical sign of the wounds Jack and his mother now carry. And to Jack, it isn't all bad. Room was his first home, his entire world for most of his life. It holds many happy memories of the life he shared with his mother, a life he never knew was so incredibly limited because of their captor. So saying good-bye is in part bitter for him. He is saying goodbye to a place and to things he loves. And in this way, Donoghue illustrates how even the darkest and most unimaginable tragedies aren't always black and white. That people can create good in horrific situations, that there can be love and life where it would otherwise seem impossible. Ultimately, though, I think the act of saying good-bye is the most important facet of this scene. It shows Jack and Ma's autonomy, that they are choosing to go back to the physical space of their tragedy and say good-bye to it. In doing so, they acknowledge Room, they acknowledge the trauma and tragedy they suffered. And then they say good-bye, they choose to move on. I think that's the hardest place to get to if you have encountered any sort of suffering in your life. But ultimately, Donoghue is hopeful. It may be hard, but Jack and Ma can move on. They can have a rich and beautiful life despite what happened to them. And isn't that an amazing thing? Has anyone else read Room? What's one of your favorite quotes? I've read Room! It really stuck with me, it is one of the few recently publish books that I have re-read. Each time I've read it, I've found that I have to read it in a single sitting or single day. I find there's just something about the writing that pulls me all the way in, and I just can't stop till the end. Yes, I totally agree about reading it in a single sitting. I was up late into the night reading Room, but it's totally engrossing. It just pulls you in. Such a great book! That image of a crater is really stunning. Also, having not read Room (yet) but having heard about the book, I was very curious about how the narration would work from the perspective of a five year old. Even in this short passage I think it's apparent what an amazing job that Emma Donoghue has done. Yes, the narrator is fascinating. He's so well-drawn and has such a unique voice. He's clearly a child, but a precocious one whose world is totally different from that of other five-year-olds . Donoghue did an excellent job with him.